This is the third in a five-part series from the Fronteras Desk called “The Costs Behind a Migrant Crisis.” Listen back to part one and two. But now, the train only comes here to bring in work crews who are repairing the tracks. Migrants who once lined the tracks have been replaced by police and Mexican immigration agents. They circle the town in trucks after months of raids, pulling migrants off trains and erecting concrete walls with barbed wire near the tracks to prevent access. Migrants still show up here though, albeit in far fewer numbers. Today Arriaga is still a possible first or second stop on the trek North depending on the route followed from the Guatemalan border. Guatemala and El Salvador have consulates in Arriaga. But now, many migrants leave Arriaga on foot instead of on the train. Alex Morales said he’d been deported from Boston to Guatemala recently after living for 20 years in New England. “It’s very hostile and dangerous,” he said inside the casa de migrantes, or the migrant shelter in Arriaga, referring to Mexico’s pressure on the southern border. One lawyer with the attorney general’s office of Oaxaca called it a “climate of legalized anarchy” in the South. See more images of the migrant crisis on Mexico’s southern border. Morales was hunkered down in Arriaga after walking the better part of 200 miles inland over the course of two weeks to avoid checkpoints. He said he camped out at night not knowing whose land he might be on. The landscape here is littered with stories of abuse of migrants, not just by authorities but also by ordinary people. The checkpoints, mobile and fixed, are a major component of Mexico’s border offensive. U.S. funds have paid for some of the checkpoints. Morales says they are working. 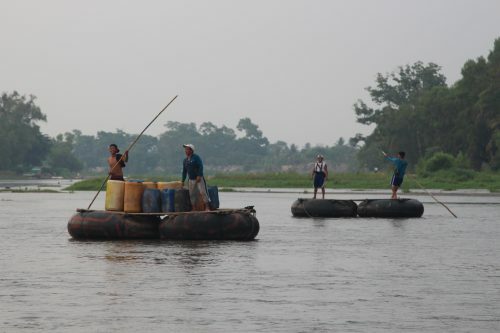 “It’s hard for the immigrant people to cross Mexico. It’s no easy way,” he said. Starting in July 2014, Mexico sent immigration agents from other parts of Mexico to the south, raided trains and migrant hostels and set up more mobile checkpoints. Police officer Gisella Claribel patrols the tracks in Arriaga, but she said the only migrants she looks for these days are those sleeping under decommissioned rail cars near the now-barely used station. “A lot more checkpoints have been put in and around Arriaga,” she said in Spanish. Beads of sweat poured down her face and she squinted in the harsh sunlight. A blanket of diesel fumes permeated the area around the tracks where repairs are taking place. She defended the campaign of raids on the trains, saying assaults and murder are commonplace on them. “Mexico is concerned about migrants’ welfare,” she claimed. The U.S. government is supporting Mexico’s southern border operations with technology and training, part of an operation that Mexico says is establishing order. Others say it’s more like chaos. 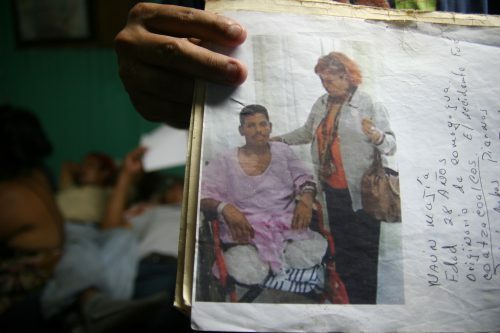 Like 22-year-old Salvadoran Miguel Angel Ochoa, who was crouched under under a rail car. Ochoa was plotting his next move North from Arriaga after enduring what he said was a harrowing journey from the border with Guatemala to get here. He described a situation that mirrored Morales’ experience. But there was one difference. Ochoa said Mexican immigration agents aren’t the problem, it’s Mexican federal police. “If you don’t pay them, they hand you over to immigration,” he alleged. He said he knew that because he didn’t pay on a previous attempt to traverse Mexico. He was arrested, deported to El Salvador and is now trying again, determined to get to the U.S. to be with his wife and U.S.-born daughter in Arkansas. Some migrants are still managing to break through Mexico’s border barricades. “They’re taking the road network— buses, vehicles— and getting through [by] corruption, through bribery,” said Adam Isacson, a researcher at the Washington Office on Latin America, a leading research group on security in this hemisphere and border policy. In addition to individual migrants, Isacson said the human smuggling networks have also adjusted to the new way of border life. “I think that (bribery) is the number one driver that is allowing smuggling networks to reassemble their roots as quickly and easily as they did. Corruption is rife and it is unpunished, and it is largely uninvestigated in the agencies we’re talking about. So it makes sense that they’d find a new accommodation reasonably quickly,” he explained. “Our main concern is to make sure that those who are in need of international protection have access to the asylum system in Mexico,” Leclerc continued. She said virtually all migrants express variations on the same theme: organized crime, poverty and weak social institutions. Migrants say these outweigh any risk implied by heading north. She believes the migrant trail today is frayed. “It’s more dangerous because people are more invisible. They are outside of the network, the humanitarian network. And it makes them much more vulnerable to extortion, to violence along the way,” Leclerc said. 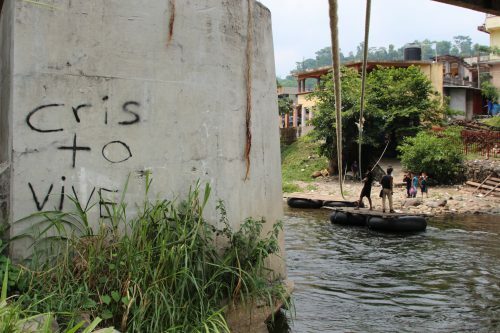 According to Mexico’s human rights commission, complaints of extortion and violence by immigration agents rose by 52 percent in year one of Programa Frontera Sur. 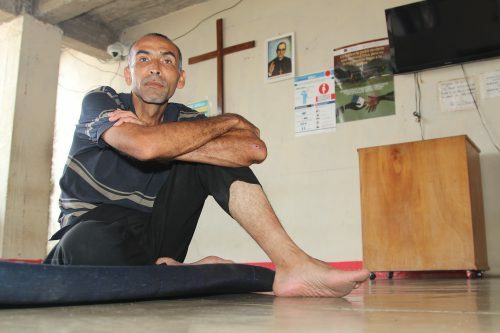 Behind Leclerc in a shielded room, migrants with bitter stories of life in their home countries— principally El Salvador, Guatemala and Honduras, called the northern triangle of Central America— were being interviewed by UNHCR staff working overtime to help guide migrants through Mexico’s asylum process. Mexican law says migrants can request asylum. And immigration agents are supposed to inform detained migrants about their right to pursue asylum status. But migrants interviewed for this story, aside from these ones being assisted by the UNHCR, said they were unaware that option existed. The U.S hasn’t spent close to all the money it pledged in 2014 to help Mexico on its southern border. Some analysts suggest that’s because the U.S. has to choose its partners within Mexican law enforcement very carefully. Maureen Meyer is an analyst at the Washington Office on Latin America. She posited that Mexico is basically stopping migrants for the U.S. “We have met with (Chiapas) state police who also talk about getting U.S. assistance,” Meyer explained. She said working with Mexican law enforcement implies inherent risk. There are no human rights certifications attached to U.S. assistance for Mexico’s southern border operations. “If you have a country like Mexico that has a history of abuse against migrants and human rights violations, you’re certainly giving more opportunity for that to happen to migrants,” by assisting law enforcement, she said. Duncan Wood, director of the Mexico Institute at the Woodrow Wilson International Center for Scholars in Washington D.C., said that for the first time, Mexico is inching toward at least a semblance of order in the South. But he also expressed concerns. In December 2015, U.S. Congress approved $750-million for social and economic development in Central America, more than doubling such assistance over the previous year. The rationale was that helping weak nations develop internally may be a better key to immigration control than more boots on the ground to detain them. This entry was posted in KRTS News and tagged Border, Border Policy, Central American Migrants, Fronteras Desk, Guatemala, Immigration, Mexico, migration, The Costs Behind a Migrant Crisis. Bookmark the permalink.